Generics and Biosimilars Initiative Journal (GaBI Journal). 2014;3(3):116-21. Study objective: To describe and compare the haematological parameters and the anaemia medication use in haemodialysis patients who were switched from the originator iron sucrose (IS) to an iron sucrose similar (ISS). Methods: A retrospective observational single-centre study describing chronic haemodialysis patients with anaemia and iron deficiency: the study compares patients being treated with erythropoiesis-stimulating agents (ESA) and the original intravenous IS (Venofer®) or an ISS (Fer Mylan®). This switch was performed for economic reasons, and without the knowledge of the treating physicians, by the hospital pharmacy. The analysis compared anaemia management in 66 chronic haemodialysis patients from three consecutive 26-week IS treatment periods (P1, P2 and P3) to a fourth 26-week ISS period (P4). ESA (darbepoetin alfa [DA]) was prescribed IV once every two weeks and IV iron was given once weekly. Haemoglobin (Hb) was assessed every two weeks, while serum ferritin, transferrin saturation (TSAT), and C-reactive protein (CRP) were collected twice per period. Results: Sixty-six patients (68% male) with an average age of 60 ± 15 years were analysed where diabetes was the most common underlying cause of renal disease (33.3%). Mean Hb levels remained stable and within the target range during treatment with IS (11.8 ± 1.0 g/dL) (P1 to P3) but decreased significantly after the switch to ISS (11.3 ± 0.9 g/dL) (P4) (p < 0.001). During the same P1 to P3 periods TSAT also remained stable (43.7 ± 8.5 %) but decreased during ISS period (23.9 ± 9.5 %). Similar changes were observed for ferritin (627 ± 360 μg/L versus 504 ± 286 μg/L, p < 0.004). There was a statistically non-significant increase in CRP during period P4. Cumulative ESA and IV iron doses which were stable during P1 to P3 had to be increased by 27.1% and 30.3% respectively during P4; resulting in a 27.3% mean increase in the total cost per patient for these medications between P3 to P4. Conclusion: The switch from IS to ISS preparation led to destabilization of this previously well-controlled population of HD patients that also resulted in an increase in total anaemia drug treatment costs. Caution should be exercised before substituting IS with ISS in the absence of therapeutic equivalence data. Non-biological complex drugs (NBCDs) are a new category of molecule, distinct from complex biological molecules such as erythropoietin-stimulating agents and conventional drugs such as ibuprofen, tamoxifen. Difficult to fully characterize, NBCDs require an elaborate manufacturing process and, in contrast to small molecule drugs, cannot be considered therapeutically equivalent on the basis of pharmaceutical and pharmacokinetic criteria alone [1, 2]. Iron carbohydrate preparations are one important class of NBCDs. Such preparations are used to treat iron deficiency anaemia and iron deficiency in a variety of chronic clinical conditions [3–7], either as monotherapy or in combination with erythropoiesis-stimulating agents (ESAs) in order to reduce the required doses and mitigate the potential toxicity of ESA therapy [8, 9]. Since free ferric iron is inherently toxic, IV iron preparations take the form of iron carbohydrate complexes in which an iron-containing mineral core is surrounded by a carbohydrate ligand for stability . Differences in the size and structure of the core and the carbohydrate shell profoundly influence the pharmacological and biological properties of the complex . Iron sucrose (IS), first introduced in 1949 , is used widely to treat iron deficiency in a variety of medical conditions and results in prompt iron utilization by erythrocytes . IS contains no dextran or dextran derivatives so cannot induce dextran-induced anaphylactic reactions . It is generally considered to have a good safety profile, as documented in clinical studies and post-marketing analyses [14–16]. This can be attributed to the stable structure of IS, which consists of a ferric oxyhydroxide iron core complexed with sucrose in water, with a molecular weight of 34,000–60,000 Da . The degree of stability of iron carbohydrate complexes is critical, since weakly bound iron may dissociate from the complex and catalyse the generation of reactive oxygen species [17, 19, 20]. Stability is highly dependent on the manufacturing process . The fact that iron therapy is increasingly being recognized as an important component of treatment for iron deficiency and iron-deficiency anaemia in a variety of clinical conditions  has led to the development and introduction of new products (ferric carboxymaltose, ferumoxytol, isomaltoside 1,000) as well as a number of ‘iron sucrose similar’ (ISS) preparations. ISS have been launched into the market under the assumption that they are identical to the originator IS. Generic drugs represent an important part of the drug armamentarium and the introduction of safe and effective generic formulation is welcome from an economic perspective and, occasionally, from a clinical standpoint if the generic drug shows a better safety and efficacy profile than the originator. However, replicating the physico-chemical identity of IS is challenging and achieving therapeutic interchangeability with the originator is even more difficult. Proof of pharmaceutical equivalence for ISS on the basis of comparable physico-chemical properties, as described in the United States Pharmacopeia (USP) , appears insufficient for NBCD drug classes since they cannot be fully characterized from a physic-chemical standpoint [1, 2]. Moreover, bioequivalence is difficult to demonstrate using IV preparations, a problem compounded with colloidal solutions such as iron carbohydrate. It has been proposed that serum iron concentration can prove bioequivalence for ISS preparations versus IS. However, serum iron is uninformative since it is not related to haematopoietic efficacy  and more sophisticated monitoring of therapeutic effect is required. In the case of iron preparations, the true bioavailability of iron can only be assessed accurately by measuring iron incorporation into red blood cells, as undertaken previously for the originator IS , iron dextran , and ferric carboxymaltose , using ferrokinetic studies. An alternative approach could be to perform a thorough clinical evaluation to assess the therapeutic equivalence of ISS preparations. However, both ferrokinetic and clinical studies are almost entirely lacking for ISSs. Even more alarming is the virtual absence of safety assessments, a cause of potentially serious concern in view of the risk of toxicity and the fragile clinical status of many patients requiring long-term IV iron therapy. A recent safety analysis showed the reporting rate of adverse events with ISSs to be nil, which is virtually impossible given the widespread, multinational use of ISS preparations  as well as the fact that several studies have demonstrated evidence for increased adverse events with the substitution of an ISS in clinical practice [25–27]. We have also previously reported short-term findings from an observational, single-cohort study demonstrating that switch from the originator IS to an ISS preparation led to destabilization of a well-controlled population of haemodialysis patients in terms of haemoglobin (Hb) levels and iron status . However, a number of factors influence the haemoglobin levels in chronic kidney disease patients over time, including the modality of dialysis, iron status, co-morbidities and chronic inflammation  such that almost all haemodialysis patients exhibit endogenous fluctuation in Hb levels [30, 31]. We have therefore undertaken a two-year analysis to determine whether the Hb and iron status of the haemodialysis patients remained stable over the long term prior to the switch to ISS. A long-term (108-week) observational, non-interventional, single-cohort study was undertaken at the Centre Suzanne Levy, Groupe Diaverum, Paris, France. The aim of the study was to compare anaemia-related haematological parameters and anaemia medication doses and costs in haemodialysis patients with iron deficiency anaemia before and after conversion from IS to an ISS as IV iron therapy at the centre. The study compared four time periods of 26 weeks each: Period 1, 19 November 2007 to 25 May 2008; Period 2, 26 May 2008 to 30 November 2008; Period 3, 1 December 2008 to 7 June 2009 and Period 4, 29 June 2009 to 3 January 2010. During Periods 1, 2 and 3, patients received IS. During Period 4, patients received an ISS, see Figure 1. Between 8 June 2009 to 28 June 2009 both IS and ISS preparations were simultaneously available at the centre so this period was excluded from analyses, as it was not possible to determine which preparation had been administered to each patient. Each of the above periods was six months in duration to avoid any differences that may have been due to seasonal practices or behaviours. No other changes to medical management occurred during any of the study periods other than an adjustment of the Hb target level at the end of 2007 following publication of new evidence [32, 33], and international recommendations suggesting a lower target Hb . IS (Venofer®, Vifor (International) Ltd, St Gallen, Switzerland; 5 mL ampoules with 100 mg iron) or ISS (Fer Mylan®, ISS2, Mylan SAS, Saint Priest, France, manufactured by Help SA Pharmaceuticals, Athens, Greece; 5 mL ampoules with 100 mg iron) were injected IV once a week at a dose of 25–100 mg iron, adapted to iron parameters. Both IV iron preparations were diluted with saline solution (0.9%) up to 20 mL volume and infused over a one-hour period, between the second and the third hour of the dialysis session. The IV iron dose was titrated according to the most recent values of transferrin saturation (TSAT) and serum ferritin, targeting a TSAT level of 40–60% and a serum ferritin concentration of 500–800 μg/L . The ESA darbepoetin (Aranesp®, Amgen, Neuilly-sur-Seine Cedex, France) was injected IV once every two weeks titrated according to the previous 3–4 Hb values and taking into account any surgical or clinical event . The target Hb range for all patients at the centre was 11.5–12.0 g/dL. Medical management of the patients did not change during the study except for the switch from IS to ISS. Data to September 2009 were obtained retrospectively; subsequent data were collected prospectively. The study population comprised all haemodialysis patients who had undergone at least 280 dialysis sessions in the unit during the study period and received at least one dose of IV iron. Measurement of Hb, serum calcium, serum phosphorus, haematology and urea (prior to dialysis) were obtained every two weeks. TSAT, serum ferritin, alkaline phosphatase, parathyroid hormone (PTH), 25-OH vitamin D, albumin, urea (before and after the haemodialysis session), adequacy of dialysis (Kt/V), C-reactive protein (CRP), fibrinogen, liver enzymes (asparamate aminotransferase [AST], alanine aminotransferase [ALT], gamma-glutamyl transpeptidase [γ-GT] and total bilirubin) were measured every three months. Routine data collection included demographics, primary cause of end-stage renal disease, number of dialysis sessions, and consumption of IV iron and darbepoeitin. All adverse events were reported according to applicable regulations and adverse events resulting in hospitalization were recorded. Mean values for Hb, TSAT and serum ferritin, and consumption of IV iron and darbepoetin, were compared using analysis of variance (ANOVA): (a) across the four treatment periods, and (b) during Period 3 (IS) versus Period 4 (IS). Paired data were also analysed using the Wilcoxon test for continuous data, and the McNemar test (Χ2) for qualitative data. The cost analysis took the approach of an anaemia drug budget impact for a third-party healthcare provider (French Sickness Funds). The costs of IV iron medications and darbepoetin were compared during IS administration and ISS administration. The unit cost of IV iron (public price) was Euros 12.98/ampoule (100 mg iron) for IS and Euros 10.20/ ampoule (100 mg iron) for ISS (Fer Mylan®). The cost of darbepoetin-α at the centre was Euros 1.638/μg. Recently, drug costs changed to Euros 10.00/ampoule (100 mg iron) for IS, Euros 8.00/ampoule (100 mg iron) for ISS (Fer Mylan®) and Euros 1.36/μg for darbepoetin-α. As a sensitivity analysis the cost assessments were repeated using the new values. All statistical analyses except the mixed-effects model used SAS V9.2 software (SAS Software Inc, Cary, NC, USA). Sixty-six patients were eligible for inclusion in the analysis and 45 (68.2%) were male. The mean age was 60 ± 15 years and the mean duration of dialysis at the start of the analysis was 62 ± 39 months. The primary causes of end-stage renal failure were diabetes (n = 22, 33.3%), glomerulonephritis (n = 15, 22.7%), hypertension (n = 16, 24.2%) and other nephropathies (n = 13, 19.7%). The mean number of dialysis sessions was 73 ± 9 sessions per patient in Periods 1, 2, 3 and 4. The mean number of Hb values recorded per patient was 50.7 (range 39–55), with a total number of 813, 828, 888 and 818 values obtained during Periods 1, 2, 3 and 4, respectively. Mean Hb concentration during Periods 1, 2 and 3, when IS was administered, was 11.9 ± 1.1, 11.7 ± 0.9 and 11.8 ± 0.9 g/dL, respectively. This decreased to 11.3 ± 0.9 g/dL during Period 4 (ISS treatment, p < 0.0001 versus Period 3 [ANOVA]), see Table 1 and Figure 2). The mixed-effects model showed that Hb remained relatively stable during Periods 1 to 3, with only minor variations that coincided with introduction of new ESA dosing guidelines at the end of 2007. During the ISS period, the model showed a mean decrease in Hb values of 0.45 g/dL (95%CI -0.66 to -0.24, p < 0.0001). Levels of serum ferritin and TSAT were stable during Periods 1 to 3, see Table 1 and Figure 2). During Periods 3 and 4, the mean concentration of serum ferritin was 618 ± 308 μg/L and 504 ± 286 μg/L, respectively (p = 0.003); corresponding values for TSAT were 45 ± 7% and 24 ± 10% (p < 0.0001). There were no significant differences between Periods 1, 2 and 3 in terms of Hb concentration, serum ferritin or TSAT. Serum concentrations of phosphorus and calcium varied across the four study periods, see Table 1. No significant differences across Periods 1 to 4, or between Period 3 and Period 4 were observed for PTH, albumin, fibrinogen, γ-GT, alkaline phosphatase, ALT, AST, leucocytes, platelets, neutrophils or Kt/V. There was a significant increase between P1–P3 to P4 on 2 values, CRP and total bilirubin, indicating both the role of the oxidative stress due to the change from IS to ISS, see Table1. Intravenous iron therapy was received by all patients during each of the four treatment periods other than seven, four, ten and two patients in Periods 1, 2, 3 and 4, respectively. Figure 2 and Table 2 summarize the mean doses of IV iron and ESA administered during the four treatment periods. Doses of both therapies were stable during IS treatment, with no significant differences between Periods 1, 2 and 3, see Table 2. Values for mean IV iron dose per patient increased significantly from Period 3 (56 ± 33 mg/week) to Period 4 (67 ± 32 mg/week), an increase of 21.1% (p = 0.031). The mean ESA dose per patient also increased from Period 3 to Period 4 (0.52 ± 0.50 μg/kg/week to 0.66 ± 0.56 μg/kg/week) by 26.9% (p = 0.005), see Table 2. This increase in anaemia medication use led to a 24.7% increase in the mean cost of medication per patient per period from Period 3 (Euros 1,422) to Period 4 (Euros 1,773). Using updated prices, the sensitivity analysis showed a similar increase in anaemia medication cost from Period 3 to Period 4 (27.3%). During the four treatment periods there were no adverse events considered by the investigators to be related to the study drugs. There were no differences in the frequency or duration of hospitalization either across all four study periods or between Periods 3 and 4. Anaemia is a common co-morbidity in chronic kidney disease  resulting from reduced erythropoietin production by the impaired kidney and iron deficiency secondary to blood loss and uremic status. Virtually all patients on dialysis require iron supplementation, and administration of an effective iron preparation is essential. Given the therapeutic importance of effectively controlling iron-deficiency anaemia  and the risk of oxidative stress and hypersensitivity reactions  the IV iron therapy must be selected carefully, particularly since it is typically injected into patients with severe chronic disease over the long term. There is evidence from these clinical studies that ISS preparations are not equivalent to IS in either setting [25–27]. In other areas of medicine, concerns have already been expressed about the risks associated with switching to non-originator compounds in the absence of adequate clinical testing [39, 40]. 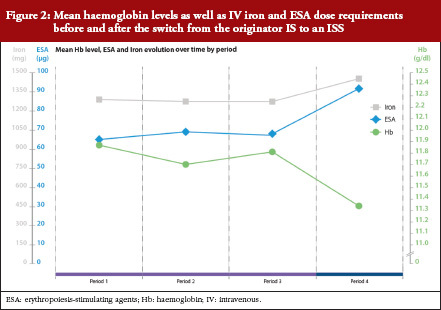 Moreover, in the current analysis, conversion to ISS resulted in a substantial increase in the total cost of anaemia medication (+ 27.3%) due to requirement for higher doses of both IV iron (+ 30.3%) and ESA therapy (+ 27.1%), thus negating the rationale for switch. In this population of stable haemodialysis patients, switch to an ISS, was associated with a significant reduction in Hb level and reduced iron indices. This deterioration was observed despite an increase in both IV iron and ESA dosing. Variations in complex structure and stability are likely to have accounted for the differences in Hb control, since the kinetics of iron dissociation influence the pattern of iron release, distribution and storage . In this population of iron-deficient individuals, TSAT values decreased dramatically after the switch, indicating that less iron was available for erythropoiesis. This may signify that iron released from the ISS had been sequestered by other compartments of the body such as the liver, consistent with the more extensive iron deposits observed in liver tissues within the ISS groups of the experimental studies, published by Toblli [41–43]. The increased levels of liver enzymes recorded in the animal model were not mirrored by evidence of hepatotoxicity in the dialysis population because doses were far lower in the clinical study, but such an effect cannot be ruled out during long-term ISS therapy in dialysis patients. It has previously been observed that the administration of IV iron carbohydrate complexes with low stability, such as sodium ferric gluconate, can result in severe and extended parenchymal liver necrosis secondary to iron-induced lipid peroxidation in non-clinical models  and the high level of total bilirubin and low TSAT seen in the current clinical trial are consistent with some degree of hepatic toxicity and less stable molecular structures in the ISS preparations . The significant increase in serum iron and TSAT described in the experimental study from Toblli [42, 43], coupled with greater iron deposition, indicates more rapid release of iron compared to IS due to overloading of serum transport proteins. Findings from the animal model described by Toblli [42, 43] were consistent with the observed clinical outcomes and may also sign post long-term toxicity risks. The examination of haemodynamic, biochemical and oxidative/nitrosative stress parameters in the non-clinical model demonstrated significant differences between the four European ISS complexes versus both the control group and the originator IS. IS, in contrast, exhibited a toxicity profile comparable to controls. Furthermore, significant differences were observed between the ISS preparations for most biochemical, oxidative stress and nitrosative stress parameters, with ISS1 and ISS2 showing higher levels of toxicity than ISS3 or ISS4. Under normal circumstances, iron in the body remains protein-bound until required for metabolic processes, to avoid tissues becoming exposed to the free cation. Free iron in the cytosol can react with oxidatively susceptible biomolecules, catalysing the formation of reactive oxygen species  with potentially damaging effects [45–47]. These variations may at least partly explain the differences observed in the current clinical and non-clinical studies. In conclusion, these clinical studies point to important variations between ISS complexes and IS and raise doubts about the interchangeability of IS and ISS preparations. Moreover, the requirement for higher dose of both IV iron and ESA not only reversed the expected cost benefit for conversion from IS but also can raise concerns about the need for higher doses of medication. In both cases, this is worrying given the current emphasis on minimizing ESA dosing as well as the preclinical data suggesting damage to liver, heart and kidney with the use of an ISS. Hence, clinical evidence on safety and therapeutic benefit should be established before use (or approval) of iron similar compounds. Data were recorded by Hemodial (PHP development). The authors wish to thank Dr Antoine Lafuma for contributing to the statistical analysis of the observational study. Disclosure of financial and competing interests: Vifor (International) Ltd financially supported the independent statistical analysis of the long-term observational study by CEMKA/EVAL. Vifor Pharma Ltd did not contribute to the study design. Professor Jacques Rottembourg has received a consultancy fee from Vifor Pharma Ltd following the conclusion of this study. 1. Schellekens H, Klinger E, Mühlebach S, et al. The therapeutic equivalence of complex drugs. Regul Toxicol Pharmacol. 2011;59(1):176-83. 2. Schellekens H, Stegemann S, Weinstein V, de Vlieger JS, Flühmann B, et al. How to regulate nonbiological complex drugs (NBCD) and their follow-on version: points to consider. The AAPS Journal. 2014;16:15-21. 3. Fishbane S, Pollack S, Feldman HI, Joffe MM. Iron indices in chronic kidney disease in the National Health and Nutritional Examination Survey 1988-2004. Clin J Am Soc Nephrol. 2009;4(1):57-61. 4. Valderrábano F, Hörl WH, Macdougall IC, et al. PRE-dialysis survey on anaemia management. Nephrol Dial Transplant. 2003;18(1):89-100. 5. Jankowska EA, Rozentryt P, Witkowska A, et al. Iron deficiency: an ominous sign in patients with systolic chronic heart failure. Eur Heart J. 2010;31(15):1872-80. 6. Wilson A, Reyes E, Ofman J. Prevalence and outcomes of anemia in inflammatory bowel disease: a systematic review of the literature. Am J Med. 2004;116(Suppl 7A): 44S-49S. 7. Knight K, Wade S, Balducci L. Prevalence and outcomes of anemia in cancer: a systematic review of the literature. Am J Med. 2004;116 Suppl 7A:11S-26S. 8. Solomon SD, Uno H, Lewis EF, et al; Trial to Reduce Cardiovascular Events with Aranesp Therapy (TREAT) Investigators. Erythropoietic response and outcomes in kidney disease and type 2 diabetes. N Engl J Med. 2010;363(12):1146-55. 9. Pfeffer MA, Burdmann EA, Chen C-Y, et al. A trial of darbepoetin alfa in type 2 diabetes and chronic kidney disease. N Engl J Med. 2009;361(21):2019-32. 10. Danielson BG. Structure, chemistry, and pharmacokinetics of intravenous iron agents. J Am Soc Nephrol. 2004;15 Suppl 2:S93-8. 11. Paschen HW. Efficient anaemia treatment with large intravenous iron doses. Geburtshilfe Fauenheilkunde. 1949;9:604-16. 12. Beshara S, Lundqvist H, Sundin J et al. Pharmacokinetics and red cell utilization of iron(III) hydroxide-sucrose complex in anaemic patients: a study using positron emission tomography. Br J Haematol. 1999;104(2):296-302. 13. Gasche C, Berstad A, Befrits R, et al. Guidelines on the diagnosis and management of iron deficiency and anemia in inflammatory bowel diseases. Inflamm Bowel Dis. 2007;13(12):1545-53. 14. Locatelli F, Aljama P, Bárány P, et al. Best Practice Guidelines Working Group. European Best Practice Guidelines (EBPG). Nephrol Dial Transplant. 2004;19 Suppl 2:ii1-47. 15. Bailie GR, Clark JA, Lane CE, Lane PL. Hypersensitivity reactions and deaths associated with intravenous iron preparations. Nephrol Dial Transplant. 2005;20(7):1443-9. 16. Yee J, Besarab A. Iron sucrose: the oldest iron therapy becomes new. Am J Kidney Dis. 2002;40(6):1111-21. 17. Geisser P, Baer M, Schaub E. Structure/histotoxicity relationship of parenteral iron preparations. Arzneimittelforschung. 1992;42(12):1439-52. 18. Stewart T, Freeman J, Stewart J, et al. Anaemia in heart failure: a prospective evaluation of clinical outcome in a community population. Heart Lung Circ. 2010;19:703-5. 19. Qunibi WY, et al. The efficacy and safety of current intravenous iron preparations for the management of iron-deficiency anaemia: a review. Arzneimittelforschung. 2010;60(6a):399-412. 20. Geisser P, Burckhardt S. The pharmacokinetics and pharmacodynamics of iron preparations. Pharmaceutics. 2011;3(1):12-33. 22. Speyer BE, Doney VJ, Fielding J. Transfer of iron from Ferastral and other organic complexes to transferrin as measured by reticulocyte uptake. Scand J Haematol Suppl. 1977;32:215-21. 23. Beshara S, Sörensenj, Lubberink M, et al. Pharmacokinetics and red cell utilization of 52/Fe/59/Fe-labelled iron polymaltose in anaemic patients using positron emission tomography. Br J Haematol. 2003;120(5):853-9. 24. Bailie GR, Hörl WH, Verhoef JJ. Differences in spontaneously reported hypersensitivity and serious adverse events for intravenous iron preparations: comparison of Europe and North America. Arzneimittelforschung. 2011;61(5):265-75. 25. Stein J, Dignass A, Chow AK. Clinical case reports raise doubts about the therapeutic equivalence of an iron sucrose similar preparation compared with iron sucrose originator. Curr Med Res Opin. 2012;28(2):241-3. 26. Martin-Malo A, Merino A, Carracedo J, Alvarez-Lara MA, Ojeda R, Soriano S, et al. Effect of intravenous iron on mononuclear cells during haemodialysis session. Nephrol Dial Transplant. 2012;27(6):2465-71. 27. Lee ES, Park BR, Kim JS, Choi GY, Lee JJ, Lee IS. Comparison of adverse event profile of intravenous iron sucrose and iron sucrose similar in postpartum and gynaecologic operative patients. Curr Med Res Opin. 2013;29(2):141-7. 28. Rottembourg J, Kadri A, Leonard E, et al. Do two intravenous iron sucrose preparations have the same efficacy? Nephrol Dial Transplant. 2011;26(10):3262-7. 29. Richardson D. Clinical factors influencing sensitivity and response to epoetin. Nephrol Dial Transplant. 2002;17 Suppl 1:53-9. 30. Ebben JP, Gilbertson DT, Roley RN, Collins AJ. Hemoglobin level variability: associations with comorbidity, intercurrent events, and hospitalizations. Clin J Am Soc Nephrol. 2006;1(6):1205-10. 31. Fishbane S, Berns JS. Hemoglobin cycling in hemodialysis patients treated with recombinant human erythropoietin. Kidney Int. 2005;68(3):1337-43. 32. Drueke TB, Locatelli F, Clyne N, et al. Normalization of hemoglobin level in patients with chronic kidney disease and anemia. N Engl J Med. 2006;335(20):2071-84. 33. Singh AK, Szczech L, Tang KL, et al. Correction of anemia with epoetin alfa in chronic kidney disease. N Engl J Med. 2006;355(20):2085-98. 34. KDOQI. KDOQI clinical practice guideline and clinical practice recommendations for anemia in chronic kidney disease: 2007 update of hemoglobin target. Am J Kidney Dis. 2007;50(3):471-530. 35. Gaweda AE, Bhat P, Maglinte GA, Chang CL, Hill J, et al. TSAT is a better predictor than ferritin of hemoglobinresponse to Epoetin alfa in US dialysis patients. Hemodial Int. 2014;18(1):38-46. 36. Rottembourg JB, Dansaert A. Feasibility strategy of darbepoetin alfa administration every other week: 2005-2007 experience in a dialysis unit. Nephrol Ther. 2011;7(7):549-57. [French]. 37. McClellan W, Aronoff SL, Bolton WK, et al. The prevalence of anemia in patients with chronic kidney disease. Curr Med Res Opin. 2004;20(9):1501-10. 38. Bailie GR. Breaking new ground in intravenous iron therapy. Eur Haematol Touch Briefings. 2008;2(1):58-60. 39. Pitt B, Julius S. Easy money? Health cost savings resulting from the switch from a branded drug to a low-cost generic drug in the same class. Int J Clin Pract. 2011;65(3):242-4. 40. Johnston A. Challenges of therapeutic substitution of drugs for economic reasons: focus on CVD prevention. Curr Med Res Opin. 2010;26(4):871-8. 41. Toblli JE, Cao G, Oliveri L, Angerosa M. Comparison of the renal, cardiovascular and hepatic toxicity data of original intravenous iron compounds. Nephrol Dial Transplant. 2010;25(11):3631-40. 42. Toblli JE, Cao G, Oliveri L, Angerosa M. Differences between original intravenous iron sucrose and iron sucrose similar preparations. Arzneimittelforschung. 2009;59(4):176-90. 43. Toblli JE, Cao G, Oliveri L, Angerosa M. Differences between the original iron sucrose complex Venofer® and the iron sucrose similar Generis®, and potential implications. Port J Nephrol Hypert. 2009;23:53-63. 44. Evans RW, Rafique R, Zarea A, et al. Nature of non-transferrin-bound iron: studies on iron citrate complexes and the thalassemic sera. J Biol Inorg Chem. 2008;13(1):57-74. 45. Geisser P. Safety and Efficacy of Iron(III)-hydroxyde polymaltose complex/ a review of over 25 years experience. Drug Res. 2007;57:439-52. 46. Devaki PB, Chandra RK, Geisser P. Effect of oral supplementation with iron(III)-hydroxide polymaltose complex on the immunological profile of adolescents with varying iron status. Arzneimittelforschung. 2007;57(6A):417-25. 47. Crichton RR, Danielson BG, Geisser P. Iron therapy with special emphasis on intravenous administration. 4th ed. Bremen, Germany: UNI-MED Verlag AG; 2008. Copyright © 2014 Pro Pharma Communications InternationalDisclosure of Conflict of Interest Statement is available upon request.